On the corner of School and Washington streets in Downtown Crossing, along the Freedom Trail, sits a brick building containing a Chipotle Mexican Grill restaurant, belying the structure’s long, storied history. 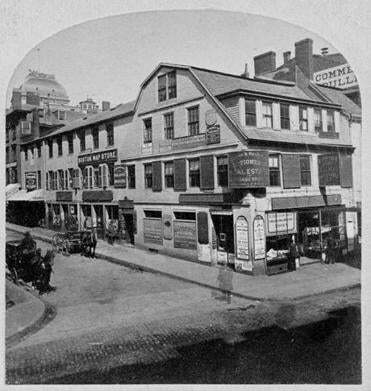 Over the years the so-called Old Corner Bookstore building, constructed in 1718, has housed a private home, drugstore, bookstore, jewelry store, and purveyor of Boston Globe-related books and memorabilia. Perhaps its most important tenant, though, was Ticknor and Fields. That company is credited with putting American literature on the map in the mid-19th century, publishing Ralph Waldo Emerson, Lydia Maria Child, Nathaniel Hawthorne, Harriet Beecher Stowe, Thoreau, Twain, Dickens, Horatio Alger, and others. Lewis, who spearheaded the successful drive to construct a statue honoring Boston-born Edgar Allan Poe near the Common, recently created a petition calling for Historic Boston , which saved the building from demolition in 1960, to do a feasibility study for a museum. In the first three weeks, over 3,000 people have signed, including author Matthew Pearl, Zachary Bos, editor of New England Review of Books, as well as presidents and executive directors of the Ralph Waldo Emerson, Nathaniel Hawthorne, and Thoreau societies. Retired stockbroker John Whelan has lived on Cape Cod for most of his life, and the light and color and character of the flexed bicep of Massachusetts seem to run in his blood. Seeking to capture the character of the place through its residents, he teamed up with photographer Kim Roderiques to make “I Am of Cape Cod: People and Their Stories’’ (Hummingbird), a recently published book of photographs and personal testimonies. The 139 subjects are young and old, wash-ashores and natives; they are musicians, businesspeople, nonprofiters, dancers, students, and sand-dune tour guides. Ramona Peters is a member of the Bear Clan of the Mashpee Wampanoag Tribe; her people have been on the Cape for 12,000 years. Mike O’Connor runs a bird-watching store in Orleans and writes of how the Outer Cape was likely the only place in the world that would be hospitable to the sort of specialized, whimsical business he wanted to run. The book shows the heartbeat and character of the sand dune at the edge of the world.